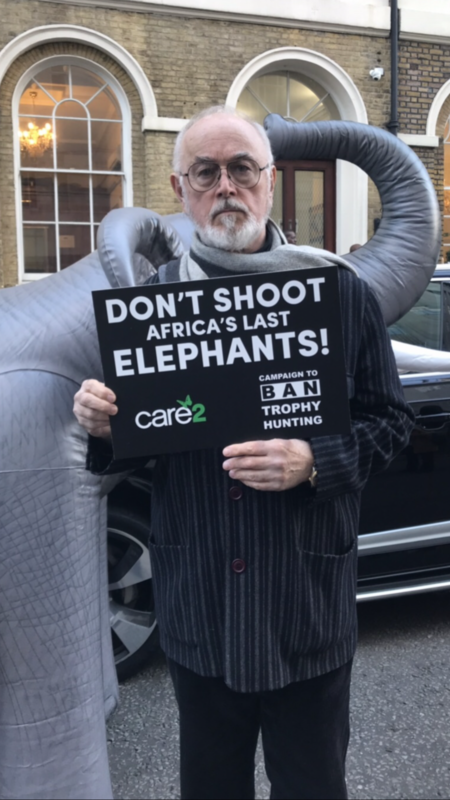 Leading conservationists, stars and politicians have called for plans allowing trophy hunters to legally kill the world’s most important elephant population to be thrown out. 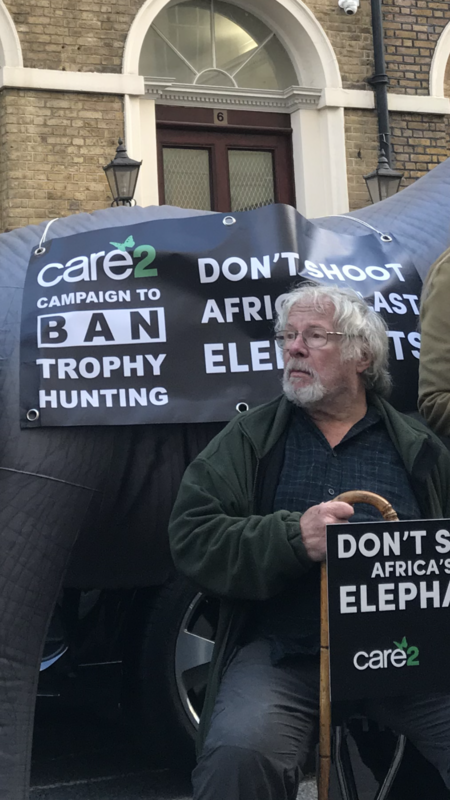 A protest in London against proposals by Botswana’s government to permit the resumption of elephant hunting marked the launch of a new campaign to make the bloodsport illegal. Sir Ranulph Fiennes, Bill Oddie, Peter Egan and Sir Ed Davey MP were among those who handed in a letter addressed to Botswana’s President that has also been signed by Nicky Campbell, Stephen Fry, Ricky Gervais, Joanna Lumley, Virginia McKenna, Chris Packham, Sara Pascoe and Carol Royle. They also delivered petitions with over 350,000 signatures calling on President Masisi to keep the elephant trophy hunting ban in place. The Campaign to Ban Trophy Hunting says nearly 2500 trophies have been brought back into Britain by hunters over the past decade, of which almost 700 were elephant body parts. As well as tusks, UK hunters have taken elephant feet, skins, bones, ears, and tails. Other popular animal trophies for UK hunters were hippos, bears, baboons, leopards, zebras and lions, and included whole bodies, skins, tails, tusks, feet, skulls, teeth, and bones, as well as mounted trophies. Campaigners say that plans to hunt elephants in Botswana could push the species further towards extinction. The country has the world’s largest population of African elephants - twice as many as any other nation - thanks largely to a hunting ban. However new President Mokgweetsi Masisi, who came into power in April 2018, wants to lift the ban. “The population of elephants has plummeted in recent years, with trophy hunting and ivory poaching largely to blame. Today, one third of all African elephants in the wild are found in Botswana. 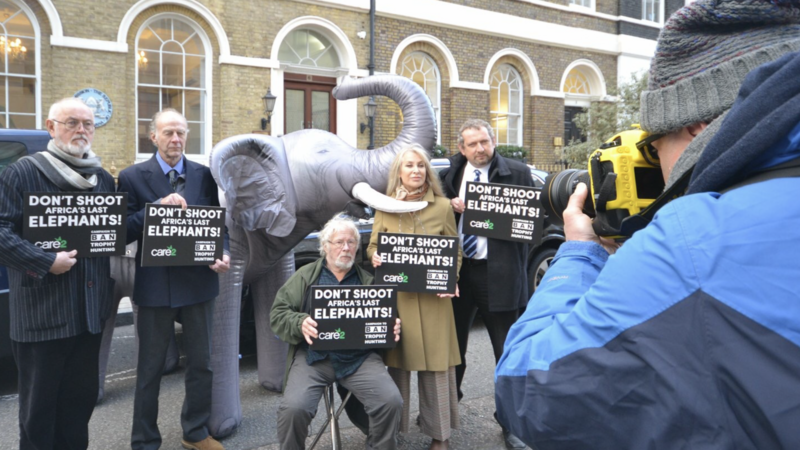 Figures released by the Campaign to Ban Trophy Hunting show that over the past decade (2008-17) 693 elephant trophies have been brought back into the UK by British hunters. In 2017 alone, the list of trophies included 8 elephant ears, 1 set of bones, 4 feet, 6 skins, 1 tail, and 4 tusks. Over the last 10 years, 2498 hunting trophies in all have been imported by hunters into the UK. In 2017, the list included 15 lion bodies and skulls; 17 hippo tusks, skulls and ‘leather products’; 2 polar bear bodies; 2 wolves; 2 brown bears; and a leopard skull. According to UN figures released by the Campaign to Ban Trophy Hunting, the list of animals killed by U.K. trophy hunters over the last 10 years includes: Elephants, Hippos, Black bears, Baboons, Leopards, Zebras, Lions, Caracals, Crocodiles, Vervet monkeys, Brown bears, Wolves, White rhinos, Cougars, Cheetahs, Polar bears, alligators, rhinos, walrus, pygmy hippos, North American river otters, Bleeding Heart Monkeys, Mantled guereza monkeys, Blue Monkeys, African Green Monkeys, wild cats, Eurasian Lynx, oryxes, bobcats, antelopes, Aardwolf, African civets, honey badgers, servals, wild goats, and Barbary sheep. Ricky Gervais also hit out against the moves: “If trophy hunting elephants in Botswana is made legal again, we might as well say goodbye to them now. It will be the end for African elephants, and all because some rich psychopath enjoys murdering a magnificent animal”. 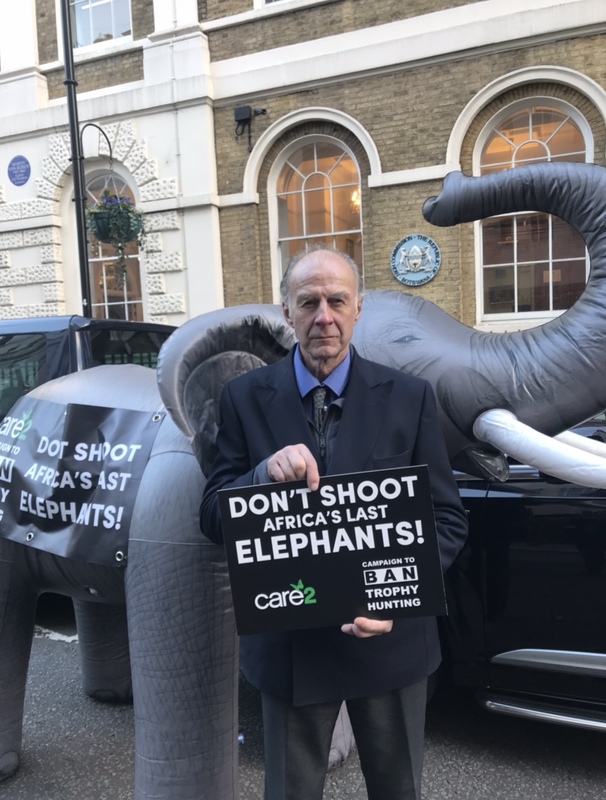 Damian Aspinall added: "As a conservationist and as someone directly involved in working to save persecuted species, I can say from first-hand experience that hunting for 'sport' is putting tremendous pressure on our wildlife. Trophy hunting is simply inexplicable and inexcusable, and those who practice it need to take a long, hard look at themselves and what they’re doing. Elephants have been with us for millions of years. Are we really going to allow them to disappear within the blink of an eye just because a handful of people take pleasure from killing them?" Chris Williamson MP (Labour) added: “The appalling, indiscriminate killing of elephants for their tusks is barbaric. There has been a spate of killings in Botswana, a previous safe haven for these beautiful creatures. That’s why I am calling on the Botswana Government to take action to address the slaughter of these animals without delay”. Over the past decade (2008-17), 693 elephant trophies hunted by British hunters have been brought back into the UK. The trophies include elephant feet, skins, bones, ears, and tails. In addition, some 864.1kg of elephant tusks have been brought into the UK by hunters during the same period. In 2017 alone, there were 8 elephant ears, 1 set of bones, 4 feet, 6 skins, 1 tail, 4 tusks and 1 hunting trophy brought back to the UK from African safaris. Over the past decade, almost 2500 trophies have been imported by hunters into the UK. The total figure for 2008-2017 was 2498. After elephants, the most popular trophies were from hippos, black bears, baboons, leopards, zebras and lions. Other animal trophies brought into the UK by trophy hunters include alligators (trophies), rhinos (trophies, skins), walrus (skulls, skin pieces), pygmy hippos (trophies), North American river otters (skins), Bleeding Heart Monkey (trophies), Mantled guereza monkey (trophies), Blue Monkey (trophies), African Green Monkey (trophies), wild cats (bodies, skins, skulls), Eurasian Lynx (trophies, skins), oryx (trophies, bodies), bobcats (trophies), antilopes (trophies), Aardwolf (live animal), African civet (trophies, skulls), honey badgers (trophies), servals (trophies), wild goats (trophies), and barbary sheep (trophies). * For more information regarding media usage, ownership and rights please contact Campaign To Ban Trophy Hunting.